I have been following Amanda Bonilla's progress since I "met" her years ago on the Query Tracker Forum boards. It was so exciting to see her progress from a querying hopeful author to an agented writer to... three book deal! Then her first book came out, and a few months later I realized that she was enduring a case of Title Drama. Authors have probably succumbed to Title Drama since titles were invented. (Hmm... Egypt? "Hey! That's the name of MY papyrus.") Amanda has shown such perseverance as an author, and such grace with her successes, that I had to ask her to share her story. 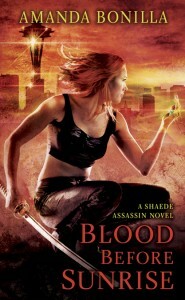 --Sarah P.
I wrote my urban fantasy, SHAEDES OF GRAY in 2009. The title was something that I agonized over. In fact, I think in the very first draft of the manuscript, I dubbed the story “Shadow Book” or something to that effect. It wasn't until the first draft was complete that I settled on Shaedes of Gray for the title. I wanted to make sure that it would stand out when it popped up in an agent’s inbox and so, before I queried the novel, I checked Barnes and Noble, Amazon, Borders, and Google, to make sure there weren't hundreds of books with the same or similar title. At the time, I could only find two or three books titled Shades of Gray in one variation or another and so, confident that my title would stand out, I began to query. Fast forward another year. 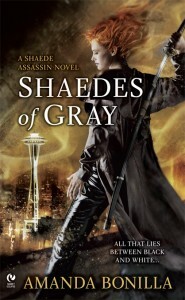 Shaedes of Gray debuts in December. A blogger mentions the book on Twitter to which someone responds, “You know that used to be Twilight fanfic, right?” Cue me, totally bewildered. The last time I’d checked, I hadn't written any Twilight fanfiction, so I wasn't sure what was going on. I did a little research and discovered a former Twilight fanfic titled FIFTY SHADES OF GREY and finally everything made sense. No necktie on the cover here, people!. This is about the time I hit the brakes. Was this the start of an identity crisis? Or more to the point, a book identity crisis? I worried that my book would be lost in the shuffle. That readers would see the cover and think, No. That’s not the book I want. But, honestly, the anxiety passed quickly. I realized that there’s room on the shelf for a hundred books with “shades” in the title. And just because one of those books was a pop culture sensation, it didn't mean that my book would be ignored or disregarded. In fact, sharing a similar title sparked conversation about my book. If it wasn't for the many titled “shades” books, mine wouldn't be listed on one of those which-is-which websites. Also, when you type “shades of gray” into a search engine, chances are my book will pop up with all of the others. It might draw the attention of a reader who might not have noticed it otherwise. This is how I try to think of it: I have a friend, Amanda Carlson. We’re both Amandas. We both go by Mandy for short. We’re close to the same age, and have kids almost the same age. We both write urban fantasy. Chances are, our books will be pretty close to one another on the shelves. But despite all of those similarities, one truth remains: We are not the same person and our books aren't the same. And what about all of the other Amandas out there? Amanda Stevens, Amanda Quick, Amanda Hocking, Amanda Ashley, Amanda de la Garza… I could go on and on. There’s room for all of us. Just like there’s room on the shelves for Shaedes of Gray, Between Shades of Gray, Fifty Shades of Grey, Shades of Gray, Shades of Grey, and so on… The more, the merrier! How do you feel about similar book titles? Does it confuse you? Have you ever mistaken one book for another? You can visit Amanda on her website or follow her on twitter.